A very strange and complicated storm system to dump snow in the Great Lakes on Thursday and Thursday night, possibly lingering into Friday. An upper level low will move in from Canada and merge with a piece of a storm system coming up from the Ohio River Valley to form a surface low pressure over Michigan. This weather maker will drift west and likely stall out over Michigan for several hours before moving out into Canada. In the meantime, light to moderate snow will set up just west of the center. 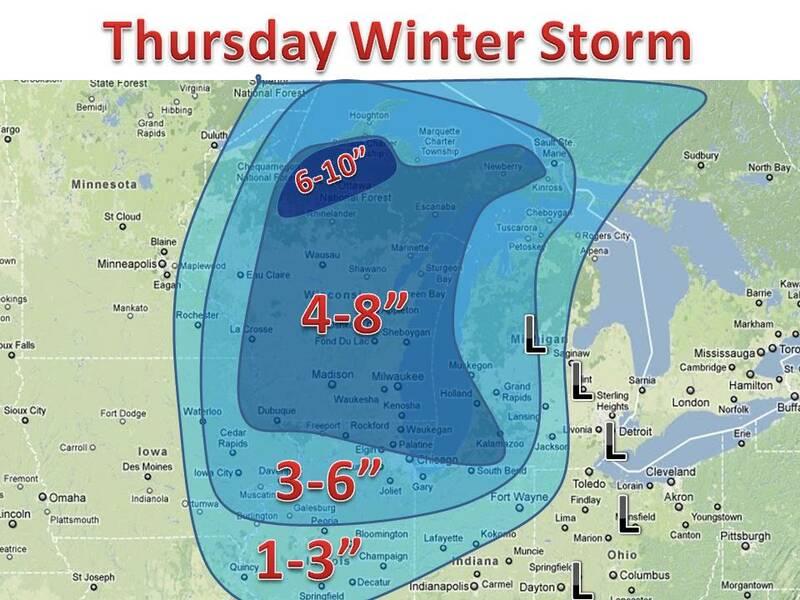 Look for deformation zone will set up over east Wisconsin. A cold front will move in from Canada during the system and temps will fall off all of Thursday. The low temps will cause for high snow ratios, in other words the snow will fluff up. The light fluffy snow will be easily blown around especially over eastern Wisconsin. 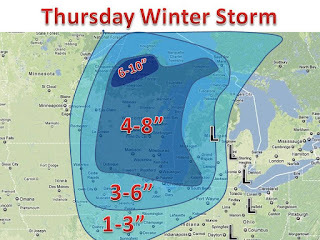 Generally look for 4-8" in Wisconsin, with less to the south. We are expecting winter weather advisories to be issued before daybreak. So stay tuned!